In the game of achieving success, attention and consistency are King. This is true whether your goal is losing weight, gaining strength, increasing your income, raising phenomenal kids, having more meaningful relationships, or anything else you would like to have in your life. To get the result you have to focus consistent attention to the necessary actions that move you towards your goal. We often have busy days, with frequent interruptions. Because of this, it is possible to miss taking action on some of your goals occasionally. Being frequently aware that you have to take action today greatly increases the likelihood that you will take that action and thus, reach you goal that much quicker. 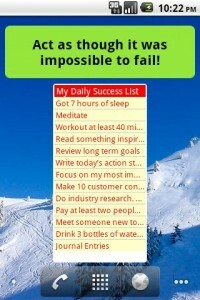 Find out more information about My Daily Success Checklist here! 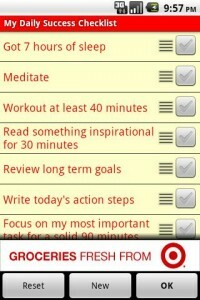 I just purchased your Daily Success app. How does one delete completed tasks? Thank you for your support of the app. You can delete a task (action) by pressing and holding it until the context menu appears. Then choose Delete from the list. If you have any other questions please send an email to developer@dancingdroid.com.